Sometimes a film inexplicably stays off our radar until the first image or trailer happens to show up, and Summit Entertainment's new supernatural thriller Sinister is one of those films. 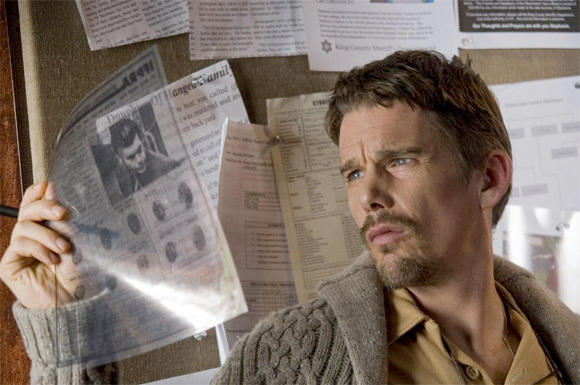 Now the film is very much in our mind as Summit has released the first images from the film starring Ethan Hawke as a true crime novelist struggling to write his next big story. However, he might get more than he bargained for when, for inspiration, he moves into a house that was the site of the horrific murder of an entire family and which contains something more than a haunting past as a supernatural entity now threatens his own family. 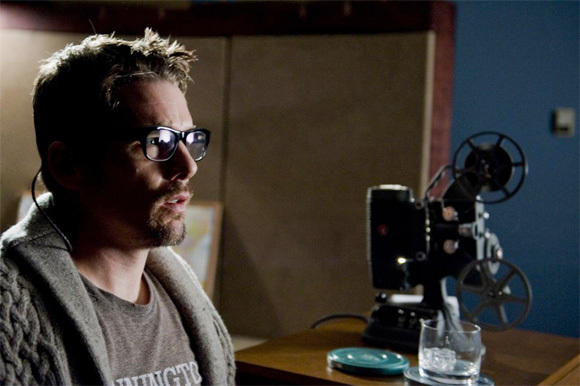 Scott Derrickson (The Exorcism of Emily Rose, The Day the Earth Stood Still) directs Sinister which he also wrote along with first-time screenwriter C. Robert Cargill. Ethan Hawke stars in the film as a struggling crime novelist whose desire for a new story leads him to the site of a horrific family murder. However, his investigation threatens to put his family in harms way as something still resides in the house that may be the key to learning the truth about the past murders. Vincent D'Onofrio, James Ransone, Fred Dalton Thompson and more all star in the film which is currently slated to hit theaters this year on August 24th. find us a trailer, ethan! Hahaha...since these images just recently came out, I'm betting a trailer isn't too far behind. Stay tuned! i've always had a soft spot for haunted house movies......hopefully this one won't be a clunker. Hawke has been doing pretty good recently...and I think "Sinister" will be a great move for him. Ethan Hawke has done well in his career by choosing projects for their artistic value.. he even got to star in Sidney Lumet's last directorial work. That's something to be proud of. I have a feeling, "Sinister", is going to deliver the unsettling thrills and chills that have been sorely lacking from recent horror flicks!